The full list on nominations can be viewed by clicking here. 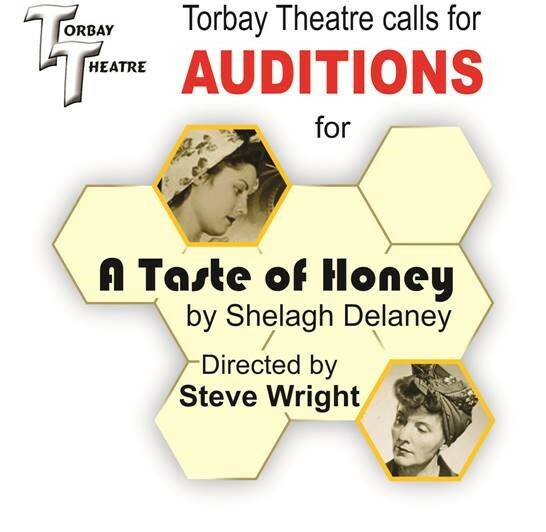 Torbay Theatre congratulates all our nominees, the winners will be announced at the awards night on 16th March 2019 at the Crown Plaza, for more info click here. 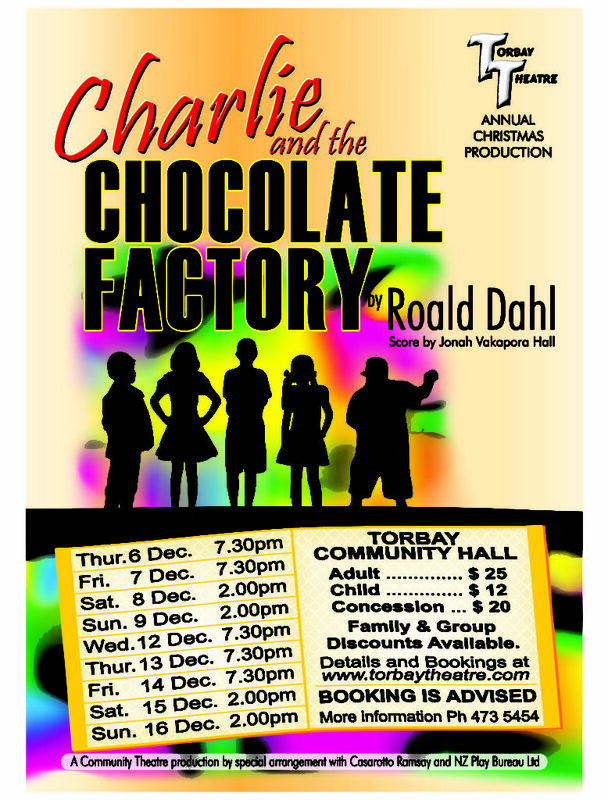 Torbay Theatre presents their annual Christmas Production, a Roald Dahl favourite – Charlie and the Chocolate Factory, featuring music by Jonah Vakapora-Hall. Charlie Bucket might not have much but he has a loving family. Charlie lives in a small house with his parents and grandparents near the chocolate factory of the reclusive and mysterious Willy Wonka. When Mr Wonka announces a competition to be able to visit his chocolate factory and win a lifetime’s supply of chocolate for the five people who find a golden ticket inside their chocolate bar, Charlie hopes to find one. Four have been found by Augustus Gloop, Violet Beauregarde, Veruca Salt and Mike Teavee. Is Charlie’s Grandpa Joe right to think that Charlie will find the fifth and final Golden Ticket? Watch as Charlie, Augustus, Violet, Veruca and Mike get exactly what they deserve. Fun for all the family, at family friendly times with two matinées each weekend. Click here to book today! You asked for it so we delivered – we’re having another CLUB NIGHT before Christmas! 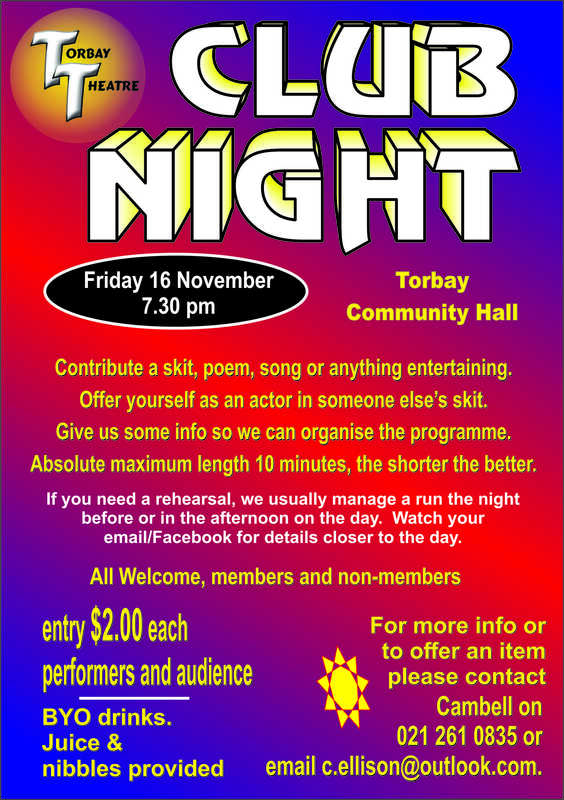 See you on on Friday 16 November at 7.30 pm! Contact Campbell Ellison on 021 261 0835 or c.ellison@outlook.com to book your slot. Or, of course, you can just come along and be part of an audience enjoying the entertainment. It is with much sadness, we advise that Life Member James (Jim) Murphy, passed away on Friday after a long battle with cancer. We have been advised by his family that his funeral will be held at 11 am on Tuesday 3rd April, at the Newstead Crematorium just outside of Hamilton (see map below). MURPHY, James Harvey (Jim). Passed away peacefully on 30th March 2018 at home in Hamilton with family at his side. Aged 67 years. Dearly loved brother of Ian and Judy and Peter and Glenys and loved uncle of all his nieces and nephews and his late brothers Donald and Allan. Jim will also be missed by his many friends in Hamilton and North Shore. 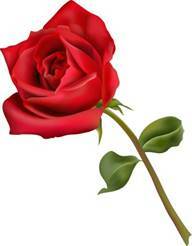 A service will be held at Newstead Crematorium on Tuesday 3rd April at 11am. 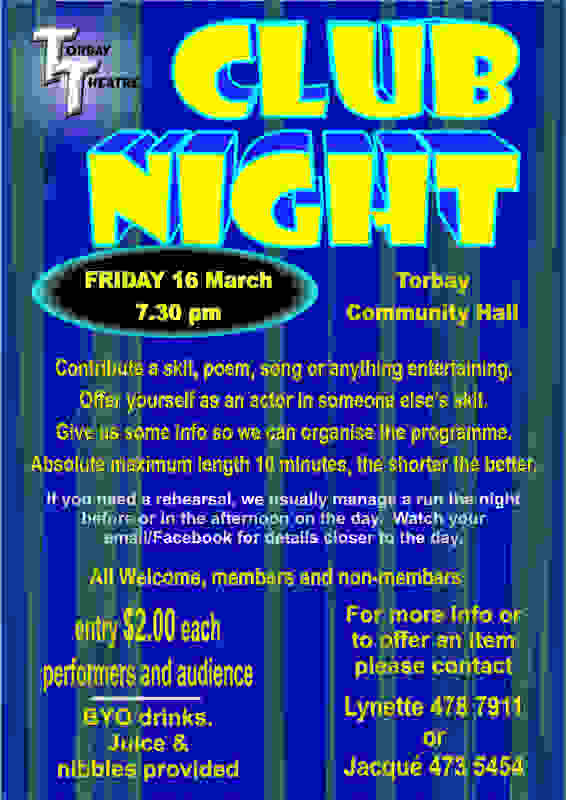 Our next Torbay Theatre Club Night is on Friday 16 March, and all are welcome to attend, both members and non-members. 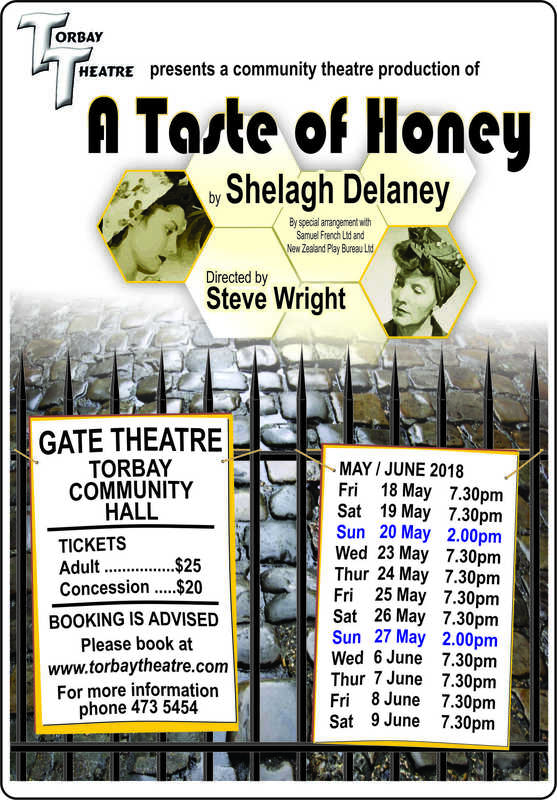 Come along for a fun night out to watch and/or join in the fun. Don’t forget to bring $2 each to contribute to expenses. Any members wishing to perform, please contact Lynette or Jacqué by Monday 12 March. Don’t be shy! 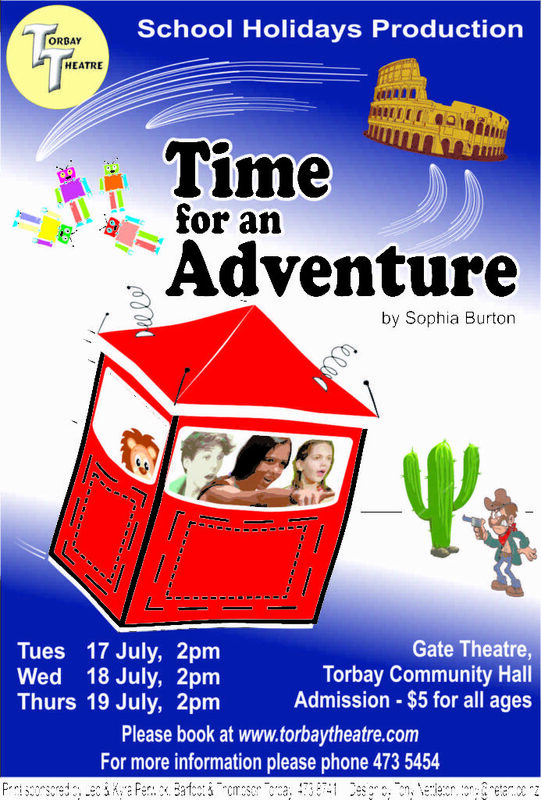 STOP PRESS: We are still looking for someone to play the awesome role of Geoffrey. Please contact us ASAP if you are interested.